19.09.2014. To enable Georgian traditional wine-makers (WMs) to popularize their home-made wines, the Georgian Traditional Wine Federation (GTWF) hosted Gori Wine Festival (GWF) on September 14. The event, now an emerging tradition, took place for the second year with a cultural gathering in the heart of Kartli region, featuring wine producers and other interested visitors from across the country. 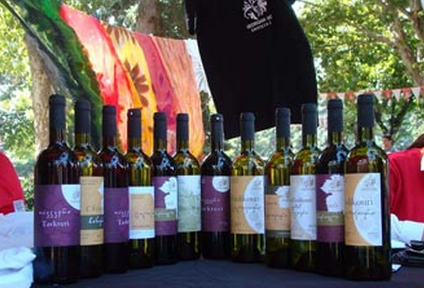 The festival featured exclusively made traditional domestic wines from different regions such as Imereti, Racha, Lechkhumi, Meskheti and Kakheti. Accompanied by a jazz band Kanudos, the event was full of color with an exhibition and fair of various hand-made crafts and diverse home-made products, including honey. Gori Wine Fest aims to develop original Georgian wines on domestic and international markets, encouraging small wine producers to popularize Georgian wine worldwide. Moreover, promoting a culture of family-wine making has the purpose of restoring and maintaining some endemic varieties of Georgian grapes. Additionally, this event increases public awareness and appreciation of Georgian wine and promotes and markets Georgian wine internationally. GTWF supports scientific research and education in viticulture and wine making, and the development of the wine tourism sector in Georgia. To achieve its goal, GTWF’s plan was to invite guests from the diplomatic corps, international organizations, tourist companies as well as restaurant and hotel managers to this historical site of Georgia. The organization has held over 250 wine-tasting as well as pouring 11 exclusive wines. Members of the organizations were given special training-seminars throughout the country to consult the wine-makers and support their businesses by conveying some equipment for pressing wine. Also, GTWF permanently provides assistance to the local producers by giving consultations and studying wine yards, which has brought together over 700 members of the Federation in just one year of its existence. The festival is a traditional event for GTWF, enabling the wine-makers to find potential consumers and partners as well as to assess the completed works, namely to check the quality of the wines by high-qualified experts. At the closing ceremony, some wine-makers were awarded: the Best Wine Krakhuna was given to Jumber Iosebashvili (Imereti), Solomon Pavliashvili (Ateni, Kartli) was recognized as the Elder wine-maker, Meskhuri Green of Giorgi Natenadze (Mtskheta) was named as the Endemic Wine　made in a pitcher. Founder of GTWF Andro Barnovi [former head of President's Administration - HN] says that the tradition will continue and Gori Traditional Wine Festival will be held again next September.